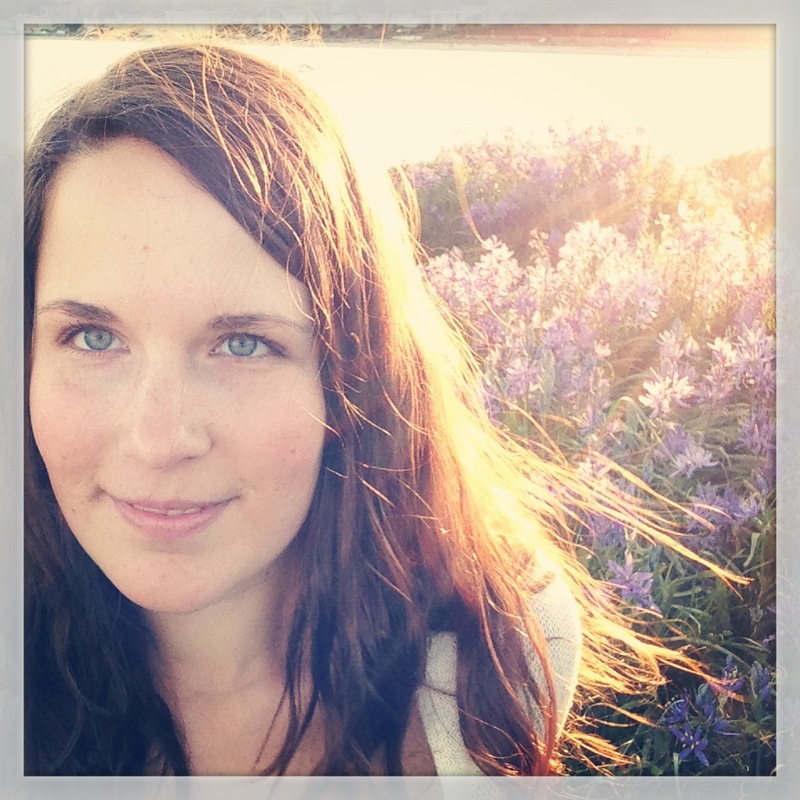 Meet Hayley of I Eat Real Food! Hayley Stobbs is a Registered Nutritional Consulting Practitioner (RNCP), and a student of Traditional Chinese Medicine. She lives in Victoria, BC, where she loves to take in the beauty of nature with hikes and ocean visits. 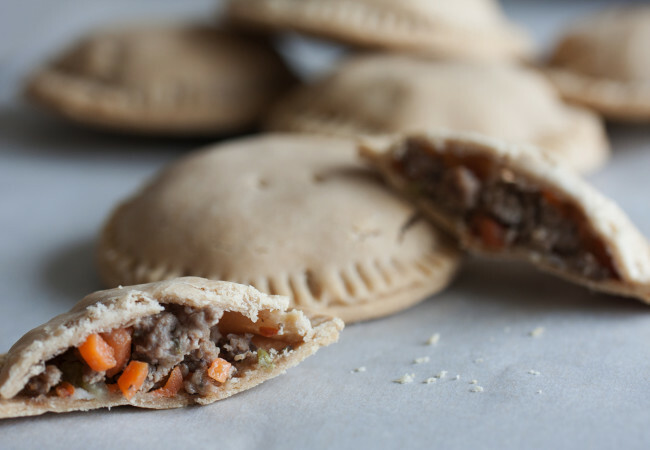 Hayley is a passionate home cook – visit her website at www.ieatrealfood.recipes to explore her creations. I first “met” Hayley through Instagram last summer. 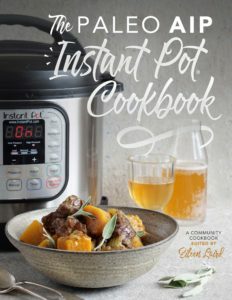 Her dreamy images of gorgeous, nourishing, whole foods caught my AIP-ing eye, and I was and still am positively smitten with all that she shares on social media. Needless to say, I was thrilled when Hayley agreed to guest post for me. Read on to learn what inspired Hayley to create these beautiful and delicious Rainbow Rolls, which you’re going to love! 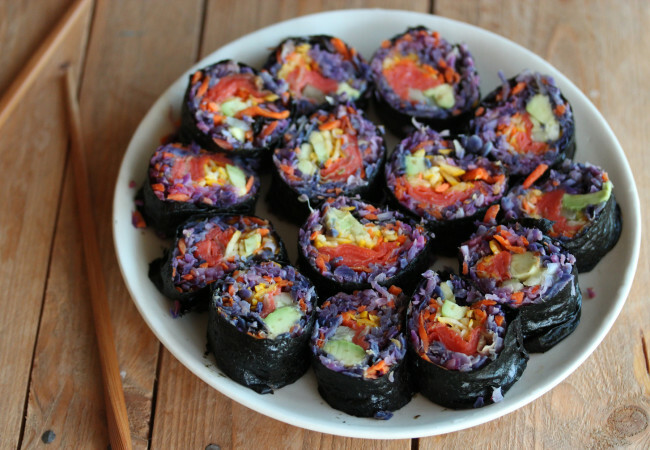 I first attempted to make rainbow rolls over seven years ago. I had a friend and her infant coming over for brunch, and I wanted to make something with festive, eye-catching colors that was savory. I delighted in the concept and colors – a pinch of turmeric for yellow, sprinkling of spirulina for green, a squeeze of grated beet for pink. My intentions were with my heart and hands. I wanted to share a beautiful and healthful meal, a reflection that I saw in my friend. This is how my creative kitchen endeavors usually start. 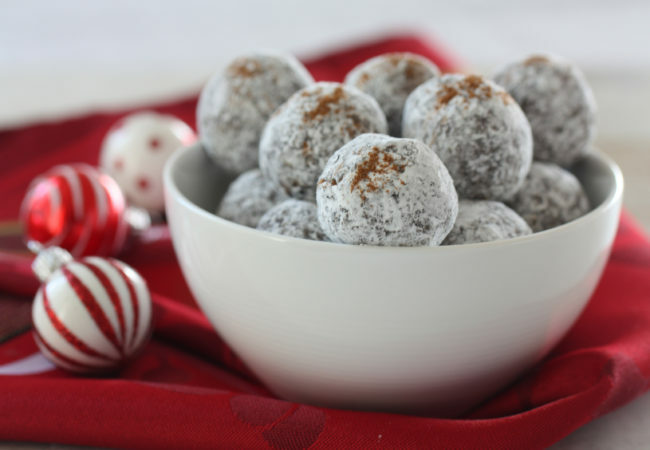 First, inspirations ignite my passion to cook – love, play, care for another and myself, whole health, the farmer’s market, innate cravings, a season or holiday, food photography and cookbooks. An idea will emerge and then I get to play with what kinds of textures, colors, and tastes I desire. Within all of this there’s an underlying desire for sustainability. 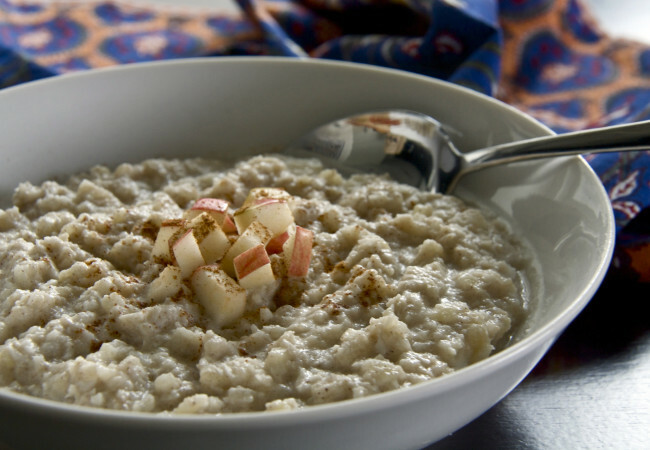 I want to make sure I will be eating that recipe again and that I can share its nourishing qualities with another. 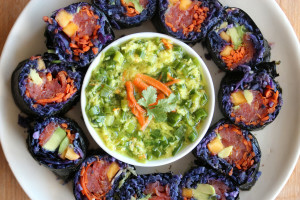 This revisited rainbow roll recipe was inspired by my love for vegetables, a guest that was coming over, and my desire for a low-fodmap alternative to rice and cauliflower. 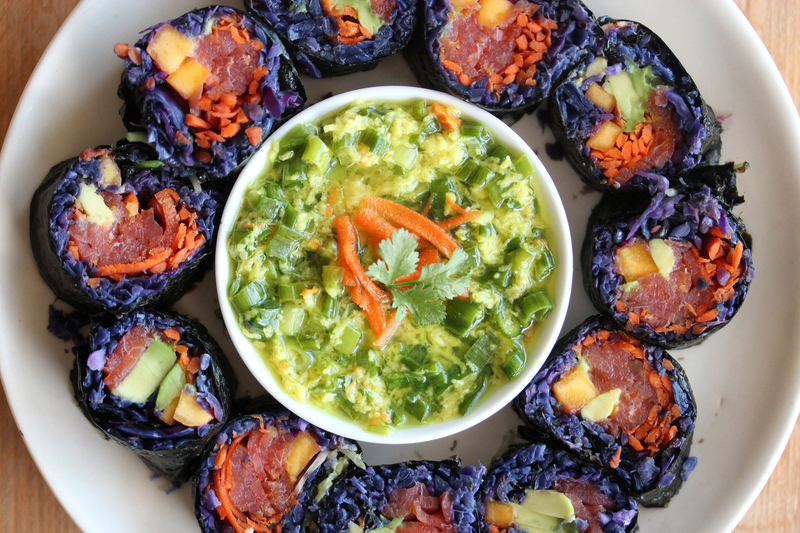 Martine ignited this idea when I saw her enjoying cauliflower rice nori rolls on Instagram. Cooking is my meditation, creative outlet, and joy. Enjoy the rainbow! Cut the cabbage into small chunks in order to fit them into the opening of your food processor. Grate the cabbage using the grater attachment. Heat the coconut oil over medium heat in a large frying pan. Add the grated cabbage and turn the heat to medium-low. Sauté the cabbage for 5-8 minutes, or until tender but still crunchy (not too soft). While you sauté the cabbage, add fresh grated ginger and dashes of sea salt to taste. Transfer the sautéed cabbage to a bowl and allow to cool slightly. Finely slice the golden beet or mango, radish, and avocado. Grate the carrot. Place these ingredients onto a plate alongside the chives or pea sprouts. 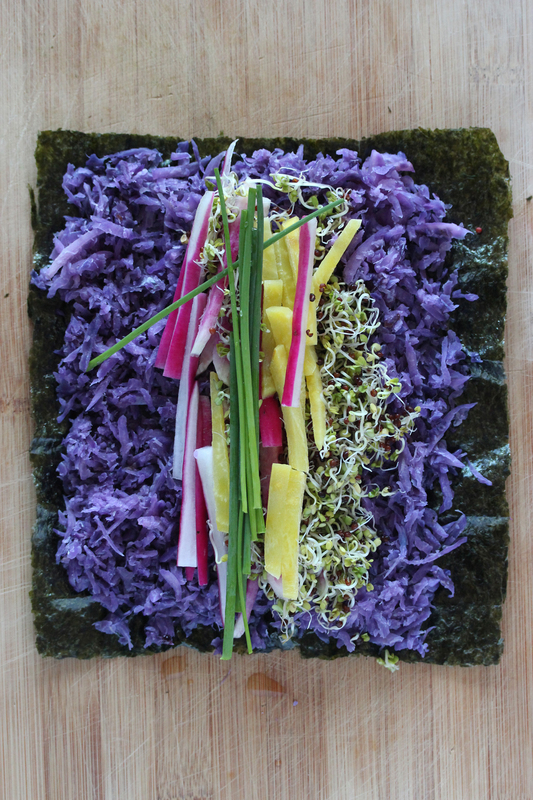 Place a nori sheet onto a large cutting board. Evenly spread approximately 1 c of the grated cabbage onto the nori sheet, leaving about ½ inch of exposed nori at the farthest end. Lightly dab that exposed portion with water. Place the remaining rainbow ingredients in the middle of the nori sheet -- smoked salmon, chives or pea sprouts, golden beet or mango, grated carrot, radish, and then the avocado. Make sure not to overfill; otherwise, it will be difficult to roll and the nori sheet will break. 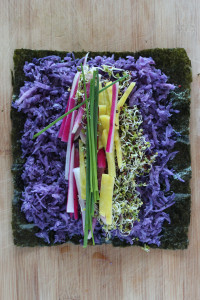 Roll the part of the nori that is closest to you over the middle line of the rainbow ingredients. Cup your hands over the nori as your roll and press firmly to form a cylindrical shape. Continue to roll once more and again cup your hands over the last section to shape. Let the roll sit for a minute; then slice with a bread knife. Be sure the knife you use is sharp in order to make clean cuts. Place the pieces of Rainbow Rolls onto a plate. Some suggestions for dipping: ginger-scallion sauce, AIP mayo, or a mixture of coconut aminos, apple cider vinegar, and scallion.